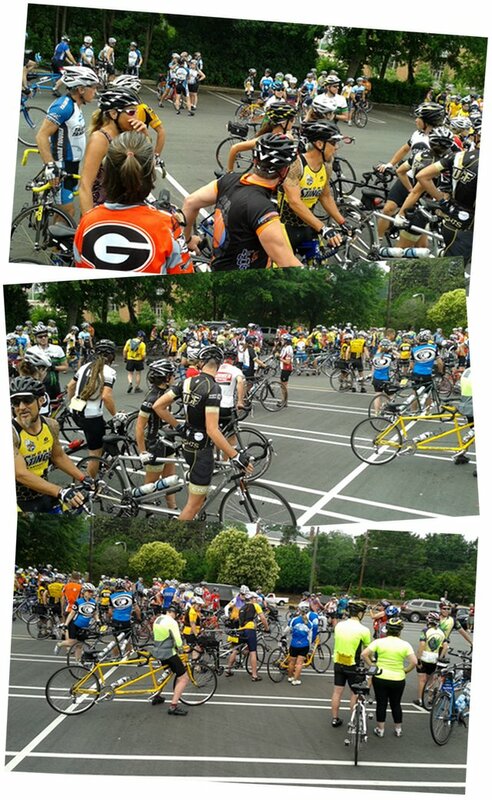 The Georgia Tandem Rally has gathered in our city this weekend … what fun! Nimue and I learned, and try to to remember, to set S.M.A.R.T. goals: Specific, Measurable, Achievable, Realistic, and Time-oriented. We’ve applied the mnemonic with success to our cycling. In 2013 the goals she chose were: 1) to ride the tandem at least 150 hours over the course of the year; 2) ride at least 2000 miles; and 3) complete a century (that is, ride the bike at least 100 miles on a single day). Obviously we couldn’t know if we’d succeeded or failed without measuring our cycling activities and recording them somehow. To make it easy on ourselves, we jotted each ride’s data down on a calendar we keep handy in the kitchen almost immediately upon coming home. Later we transferred the information to a Google docs spreadsheet. It worked: our measuring, combined with a realistic (and adaptable!) training plan, helped us reach all three goals. We also entered our rides at the Endomondo on-line sports activity tracking site. For the purpose of reaching our annual goals, it was superfluous, but we did so as part of participating in the National Bike Challenge, a program of the American League of Bicyclists to encourage cyclists to, collectively, ride toward a common goal. (This year’s challenge seeks to enroll 50,000 Americans to log 30 million miles from May to September.) In 2012 and 2013, Endomondo partnered with the NBC to provide the software platform for recording miles. After the Challenge ended, Nimue and I kept using Endomondo—we were welcome to do so (the company, for its part, hoped we’d upgrade to paid memberships). We continued recording there, I suppose, because we were in the habit. And I do solo riding that doesn’t involve the tandem; I wanted to keep track of how many miles that amounted to. Now, however, two things have changed. For this year’s challenge, the NBC rolled out its own interface for logging rides. And Nimue realized it was four-times redundant for her to record on the kitchen calendar, in our spreadsheet, on the NBC site, and at Endomondo. Today, I’ve decided that’s something I can shed as well. I appreciate Endomondo and recommend it to anyone whose needs it meets. For me, however, it’s one more thing I don’t need. A pen and a square on a calendar are enough. Comments welcome … have you any unnecessary redundancies you might reduce? 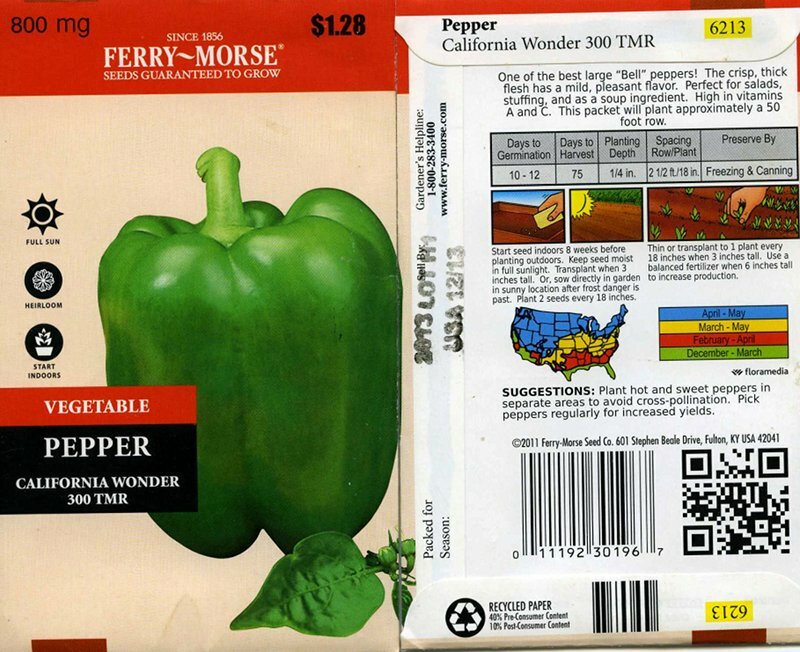 Seven different varieties … four separate seed packets (two of a six-color-mix) … five distinct trials … dozens of seeds sown … not one viable pepper plant. In rather cool and wet Wales, the Snail of Happiness charms capsicums into obeying her every wish and command. And this spring, I’ve mid-wived enough tomato seedlings that I should open an adoption agency to place them. But I can’t start a pepper to save my summer cookery. They fail to sprout. They fall to the dreaded “damping off.” Some predator that can’t be much thicker than a pencil lead lunches on their seed leaves. I give up. I let go. I accept the way the universe is tilted. I hope our CSA has a better way with them … it would be a less savory summer without peppers! Comments welcome … friends, when is it time to stay stubborn and try, try again, and when to cut our losses and move on? An office reorganization resulted in a “rubber tree” relocating to our house several years ago. (This common houseplant isn’t actually a rubber tree, but Ficus elastica, a species of the banyan figs.) We enjoyed it, and it seemed to tolerate our care, because it grew … and grew … till it hit the ceiling. Well, that wasn’t the end, because it could spend the summer out on the deck, and overwinter in the lofty garage. The unusually cold winter this year chilled the garage below freezing, however, and we lost most of the tender plants sheltering in it. The rubber tree didn’t wake from dormancy. I tried the radical measure of whacking it off just above the lowest leaf-bud, with can sometimes re-start a failing ficus. It didn’t work. It’s time to release it to the next stage of its life. To the hugelkultur mound it goes to rot in peace. Comments welcome … do you find a freeing simplicity in embracing the cycles that open to life beyond life? 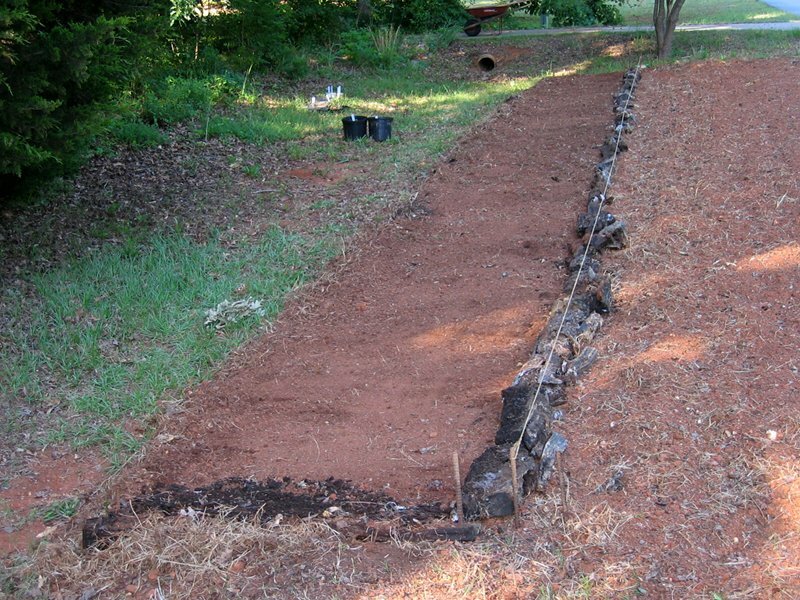 I didn’t do much gardening during the 2010–12 southeastern United States drought. While watering food gardens was permitted under the restrictions that otherwise severely curbed outdoor water use, it seemed the civic thing to limit consumption as much as we could. I did grow a few plants in containers, which I kept moist with what rainwater I could capture in water garden tubs I placed under a low place in our gutter. I’ll spare details, but I supplemented the meager rainfall with water from our showers. Nothing about the system was pretty; oak leaves turned the water tannin-brown and mosquitoes reveled in it, but it worked. Our heirloom okra grew, flowered and fruited, and therefore survived. I’ve wanted to build a better system, however, which ultimately will require repairing the gutter and doing some drainpipe plumbing. 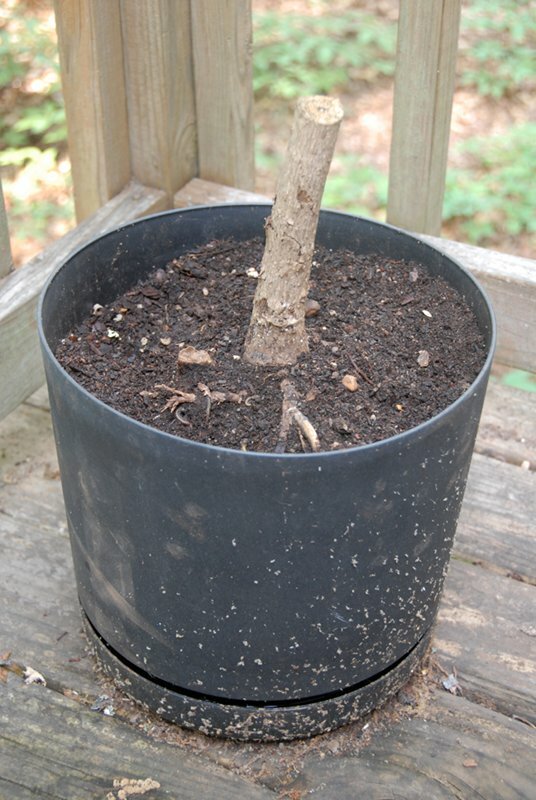 It’s not hard, and I’ve already converted one plastic trash barrel to a cistern. It just takes taking the first steps. Today I achieved at least that much. 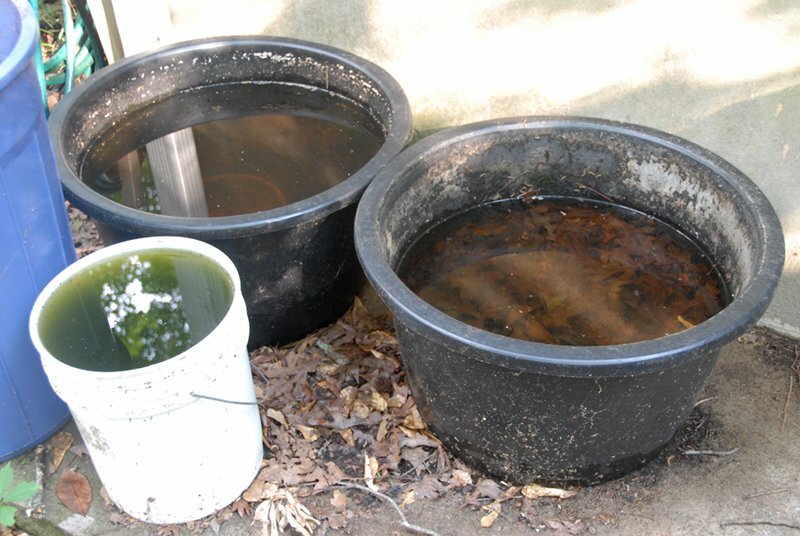 I strained the water in the tubs and bucket into barrels and added the leaves to a compost pile. 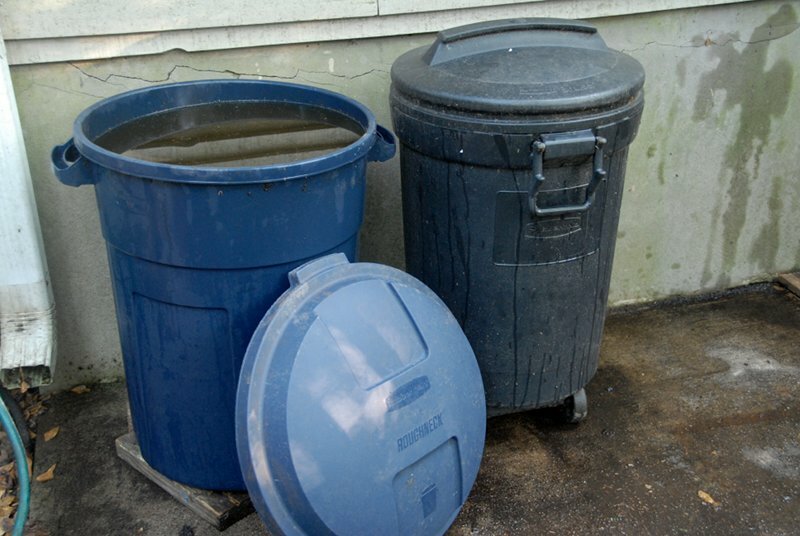 I’ll scrub down the water garden tubs and try to sell them on craigslist. They’re left over from my “more is more” days. We still have our first plastic pool, which has capacity enough for a water lily and a goldfish who does mosquito abatement duty. I enjoy having embraced that enough is just right. 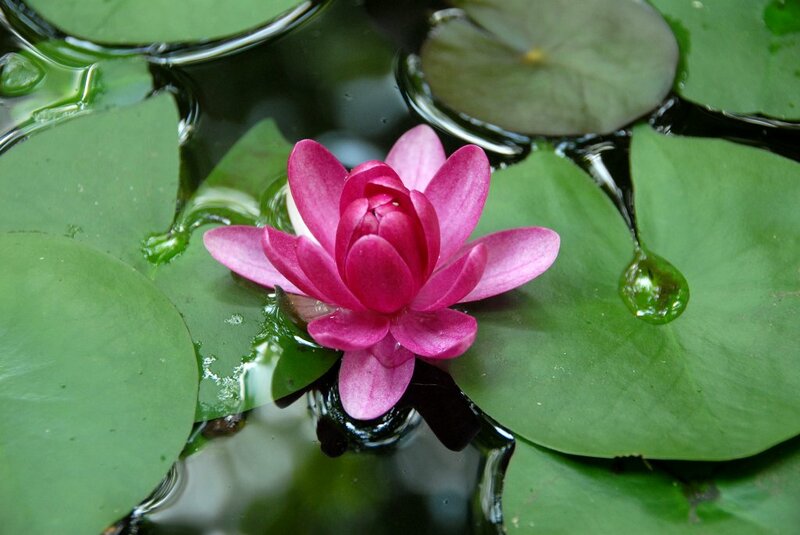 Our Nymphaea “James Brydon” is 17 years old; it celebrated the beginning of summer with this bloom. Comments welcome … have you noticed that it’s easier to do a good job of taking care of less than a lousy job of managing more? Here’s another item we acquired while furnishing a larger house than the one we live in now. We put it in the guest bedroom so visitors would have something to unpack into, but so far as I know, no one ever did … it just sat empty. More recently it’s held a few card games and a chess set, but there was more air in it than anything else. I had a notion of spicing it up by painting it Chinese red and lacquering a golden dragon decal to it. (I’d admired a friend’s similar transformation of an otherwise unremarkable piece.) That might have looked good, but wouldn’t solve the problem of what to use it for. Still, I got stuck on that plan. Then the chest became something of an attractive nuisance. Unprocessed mail and papers would pile up on horizontal surfaces like our dining table. We’d reach a crisis point, sweep it up and dump it in one of the drawers. Hey presto! apparent order! But that wasn’t really decluttering, it was procrastination. And out-of-sight, out-of-mind isn’t a good policy for papers, whether they’re important or ephemeral. So we’ve decided it doesn’t belong in our house. We hope it will find use in someone else’s. Comments welcome … are you storing any air? Years ago, when we still had a warehouse club membership, I had a fling with a some-assembly-required kit for a video game stand. Every few months when I drove to the store to buy the 40-lbs bags of clay absorbent we used for cat litter, I’d take a detour down the furniture aisle to visit it. I didn’t look at the sample and see a game stand, which we didn’t need, but a mission-style end table, which I’d convinced myself the neglected sofa in the nearly-unused living room did. (What really needed to happen was to get out of that too-big house, shedding the sofa and a lot else we tried to fill it with … but I stray beyond the subject of today’s post.) Eventually I bought the kit and brought it home. Put together, it looked nice. But it didn’t lure us onto the sofa any more often. It didn’t even collect clutter, since we were so seldom in that “living” room, so-called. We’ve called two other houses our home since, neither with the sofa (which went out to the road one day with a big “FREE!” sign on it, and when we next looked, it was gone). I’ve insisted that we keep the end table because I’ve been invested in it, but it’s never found its proper place nor use. Finally I’ve reached calm, peace, and acceptance about letting it go. I will try to sell it (cheaply) on craigslist. But if it doesn’t move soon, I just might set it out by the street. Comments welcome … have you ever had to give up on something because its usefulness never materialized? Nimue and I wish everyone a load of goodwill today! 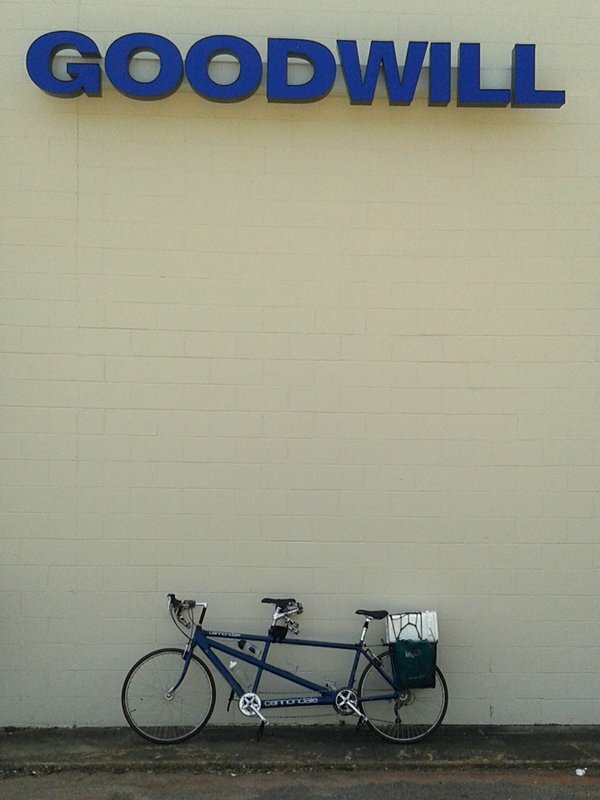 We WISTed a load at Goodwill before proceeding to the bike wash. Seven quarters later, the tandem shed the coat of mud it got riding through some low spots on the Silver Comet Trail on Monday … just in time to gleam on a metric century out of Hartwell, Georgia, tomorrow. Comments welcome … is cleanliness next to giddiness? Werner von Braun sits in our driveway in front of the garage door. Though in the way of almost everything I want to do, he’s stuck there for now since I seem to have lost his key, and old as he is, he’s nevertheless equipped with a steering lock. 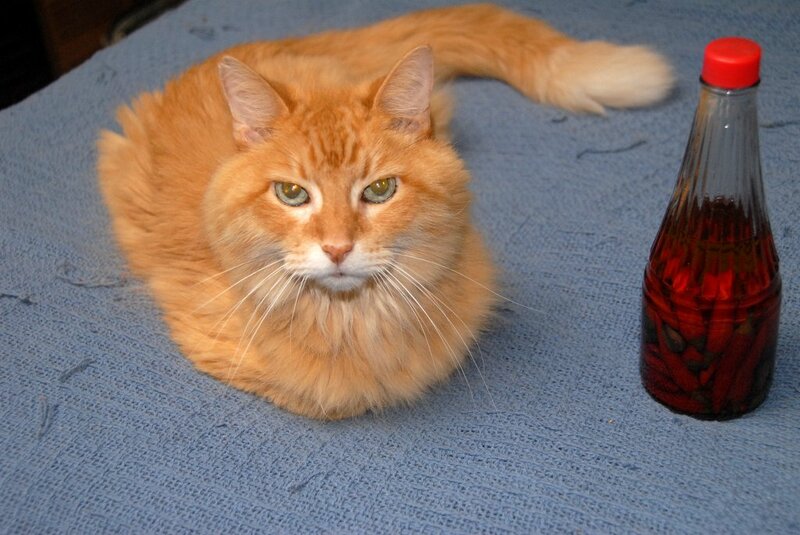 Someday this year—I promise myself!—I’ll work through what needs to be done to shed Werner. That may include a short course of therapy. Today, however, without a great deal of angst, I’m letting go of a piece of him. I was pulling the hose around his rusting brown carcass so I could complete the weekly chore of rinsing out the cats’s litter boxes when the hose hung up. I gave it a firm yank (first recourse for any fix, right? shove, thwack, kick, or jerk it). I was rewarded with a “clunk” and some slack. “What fell?” I wondered. 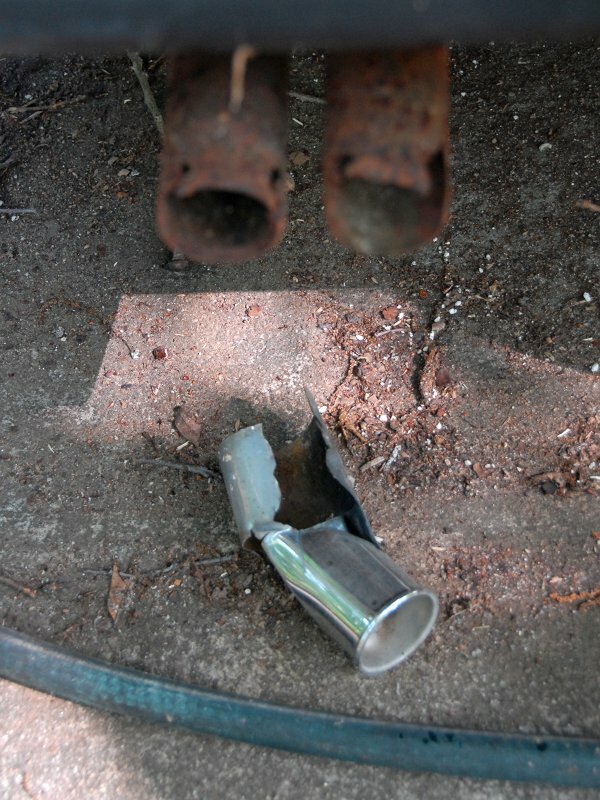 Werner’s exhaust tip was what. Whereas “exhaust tip” may sound like part of one of the electronic cigarettes gas stations have suddenly become desperate to sell me, it’s not. Rather, it’s a purely decorative tube that attaches to the end of an automobile tailpipe, supposedly to make it look elegant. I don’t care for them. If I put it nicely, I’d say that my modernist “form should follow function” aesthetic finds them superfluous. Not so nicely, I’d say that I think they look stupid. With some satisfaction, I’ll toss the tip in the pile of steel I’m collecting to take to the recycling bin dedicated for it at our county landfill. Comments welcome … what’s hiding from you in plain sight that you might shed with a righteous self-satisfaction? Running to catch up (pant, pant) … I need an easy shed. But I honestly feel it counts: I completed the first terrace of our street-side vegetable garden, and moved enough rotting wood to edge the second. That bed is a thing of beauty to me. I could lie down and sleep in it … nah, I think I’ll plant onions. Comments welcome … do your projects to simplify sometimes stretch over days? It hardly seems fair, does it?